DonorSearch helps organizations see more data in more places and in more ways using tools that include an integrated search, online prospecting, gift searching, and portfolio management. The tools are designed with the needs of non-profits in mind and are suitable for a variety of organizations including education, healthcare, culture and arts, and other community-oriented organizations. Partnership with a wide range of technology, fundraising, research, and direct mail consultancy companies enable the platform to offer users more ways to search and acquire data from multiple sources. 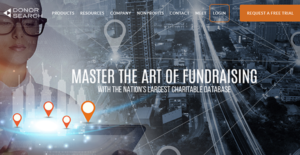 The platform uses proven philanthropy efforts for accurate, comprehensive and actionable data that allows organizations to achieve better outreach and fundraising results. The in-house prospect researchers verify the best prospects manually, ensuring better accuracy and saving non-profits a lot of valuable time. DonorSearch online tools include integrated search, online prospecting, gift searching, and My Portfolio. Integrated search features allow generating comprehensive and data-rich reports by entering required prospect information. The comprehensive reports include all the important information about prospects, including philanthropic and wealth information such as income and relationship with other organizations pursuing a specific cause. ProspectView Online provides accurate records and allows organizations to find prospects that are most likely to donate. It allows searching by traditional wealth-makers, philanthropic activities as well as affiliations with other non-profits. Wealth information indicates the ability to give, while philanthropic activity provides insights into donor’s past giving such as the total amount, donations by year, type and more. Gift Search allows searching for all gift types given by an organization, couples as well as individuals. The searching features provide a deep insight into the type of organizations and charitable causes a donor supports. Users can easily analyze the giving patterns by filtering donations by amount, year, geographic location and various other criteria. This enables users to not only see the donor-supported organizations, but also details about supporters who can potentially make connections to new donors. My Portfolio enables users to pinpoint the information they need within seconds and comes with easy-to-use, yet powerful reporting and screening tools. These tools make it easier to sort and analyze data in seconds, while also allowing exporting data for deeper analysis and comprehensive reporting. If you are interested in DonorSearch it could also be a good idea to check out other subcategories of Best Fundraising Software gathered in our database of B2B software reviews. Each company has different requirements and requires an application that can be personalized for their size, kind of staff members and buyers, and the specific industry they are in. For these reasons, no platform can provide perfect functionality off-the-shelf. When you look for a software system, first be sure what you need it for. Read some DonorSearch reviews and ask yourself do you desire basic functionality or do you require complex tools? Are there any industry-specific features that you are looking for? Get the answers to these queries to aid your search. There are lots of factors that you need to reflect on and these include your budget, particular business requirements, your company size, integration requirements etc. Take your time, use a few free trials, and finally zero in on the platform that provides all that you need to boost your firm efficiency and productivity. How Much Does DonorSearch Cost? Pricing details are available by quote. Contact the vendor for more information. We realize that when you make a decision to buy Fundraising Software it’s important not only to see how experts evaluate it in their reviews, but also to find out if the real people and companies that buy it are actually satisfied with the product. That’s why we’ve created our behavior-based Customer Satisfaction Algorithm™ that gathers customer reviews, comments and DonorSearch reviews across a wide range of social media sites. The data is then presented in an easy to digest form showing how many people had positive and negative experience with DonorSearch. With that information at hand you should be equipped to make an informed buying decision that you won’t regret. What are DonorSearch pricing details? What integrations are available for DonorSearch? If you need more information about DonorSearch or you simply have a question let us know what you need and we’ll forward your request directly to the vendor.